Work together to find clues, solve puzzles, and escape the themed room in 60 minutes or less. Hours may vary during Holiday weeks. Click Book Now to see actual schedules. "Refreshingly Unique Experience ... Outside the Box!" Storyline: You’re a gang of disorderly outlaws, and you’ve all been caught by the Sheriff. The Jailer is sleeping, and now is your chance to escape. Hurry, you only have 60 minutes to escape. "Soooo much fun! Can't wait to go again! I think I'm addicted to this now!" Storyline: It’s 1911, and someone stole the Mona Lisa from the Louvre Museum in Paris, France. A museum worker is the prime suspect, but no one has recovered the painting. Can you find the REAL Mona Lisa and return it to the Louvre? "Great challenge. Great fun. Everyone should get out and try it." Storyline: You are brave firefighters showing up for work like any other day. This dispatch is not just any call, this is the call that firefighters will talk about for years to come. Storyline: Determined to restore the kingdom to it's once prosperous state, you must reclaim your position as rightful heir by finding proof of your identity. You and a small group of allies have 60 minutes to find your proof, and escape undetected before the King returns. An Escape Room is a LIVE ACTION game for you and your friends! You will have 60 minutes to find clues, collect information, solve puzzles, and complete your challenge. Your goal is to solve a mystery or complete a final task before your time runs out! All of our rooms are fully themed so you feel like you’re in another place. Ideal Escape Rooms is owned by me (Jennifer) and my brothers (Kevin and Jeremy). I’m a certified secondary mathematics teacher with a passion for puzzles, logic games, brain teasers, and challenges. I taught in Oxford Schools as a Substitute Teacher, and then a Mentor Teacher at Oxford Virtual Academy. I still enjoy teaching and learning, but I couldn’t pass up this opportunity to work with my amazing brothers to build a family entertainment business that gets people away from phones and TVs to think together and play together in new ways. It also gives me the opportunity to learn so much about owning a business. And I have the best teachers since Kevin and Jeremy own several businesses, both individually, and together. They are hard working business owners who maintain integrity and pursue excellence in everything they are involved in. Their passions for developing ideas, creating products, staffing businesses, and marketing services are contagious. And providing excellent customer service will always be a driving force….so you’re guaranteed to benefit too! We all have busy work and family schedules, but there’s great satisfaction in working together to build something fun and new! 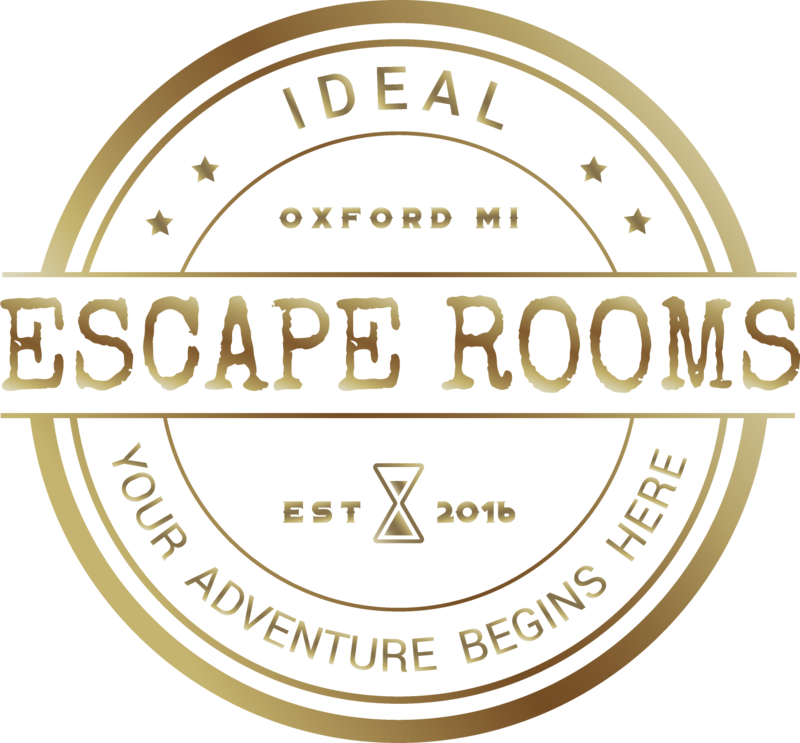 That’s why we’re so excited to bring escape games to Oxford, Michigan so you can enjoy quality, face-to-face, fun times with your friends and family. Escape games are perfect opportunities for team-building events and parties, and our wheels have been spinning about how to incorporate other fun activities, quality services, and unique entertainment experiences for a variety of audiences. I’ve had a wonderful time getting to know other escape room owners, visiting other businesses, playing lots of escape games, attending an Escape Room convention in St. Louis, researching game options, customizing games, creating puzzles, and developing business ideas. We’re all committed to quality and excellence so you can expect a high-quality, fun and memorable experience every time you play one of our games. Just in case you were wondering…this all started when Kevin played an escape game for the first time with his son, Gabe, and his friend while on vacation together. They had so much fun and wanted to play more games like that! Gabe talked about it for days, so Kevin called me and Jeremy with the idea of opening a family business together like that in Michigan! Gabe suggested that all of our families go together to play an escape game…so we did. It didn’t take long for everyone to get excited about the idea, and we immediately started talking about themes, puzzles, props, business plans, promotions, locations, and everything else that goes into opening a new small business. When we connected with the Legacy Center in Oxford, we knew we were making the right decision about where to start this new venture. You’ll find so many exciting and family-friendly things to do here! We believe this venue will attract people from many different areas to explore all the great things Oxford and Lake Orion have to offer, and many businesses will benefit. I’m proud to be an Oxford resident, and Kevin and Jeremy can say the same about Lake Orion. It’s wonderful to live and work in our hometowns. We hope you’re excited too, and you’re starting to think about who you want to bring with you when you visit. Booking Calendars are open online. Be sure to book your group soon, as we expect that schedules will fill up fast!